shent (shent), adj. [ME. Schent < pp. of schenden, to put to shame, harm; akin to G. chanden], [archaic & Dial], 1. disgraced. 2. lost, ruined, or defeated, as a case. 3. injured; damaged 4. reproached. Social work researcher and storyteller Brené Brown spent six years studying shame. She had gathered people together to ask them about their greatest accomplishments, their experiences with love and belonging. However, she found when she asked about these things, participants instead told her their greatest failures, their experience of lost love, their most painful experiences of not belonging. When she looked closer, she found shame. We’ve all experienced it. That burning sensation that begins in the gut and spirals up through the chest until it reaches our cheeks, setting them ablaze. Our faces grow red and hot and we feel a deep sense of not okayness. We want to hide. We wish we could disappear. Whether our shame emerged from something said or done by someone else or from our own self talk or deeds, we are familiar with the feeling of shame searing through us. Our moment of difficulty or confusion spins out so that we search for all the areas in our lives when we are wrong. Perhaps a coworker alluded to us not doing enough on a work project and this was this initial hit of shame, but we didn’t catch it. So soon we are spinning stories left and right about our inadequacies: we shouldn’t have taken this road: look at this traffic, idiot ; we haven’t been attentive enough to our relationships: you said you were going to call your best friend back and you still haven’t done it; you are SO selfish ; we skipped the gym: you are undisciplined, fat, ugly; we didn’t wake up as early as we said we would: and wasted the morning, we are bad friends, bad employees, bad children, bad parents, bad bad bad. It is so easy to get caught up in this web of unworthiness. Shame spins us in circles. 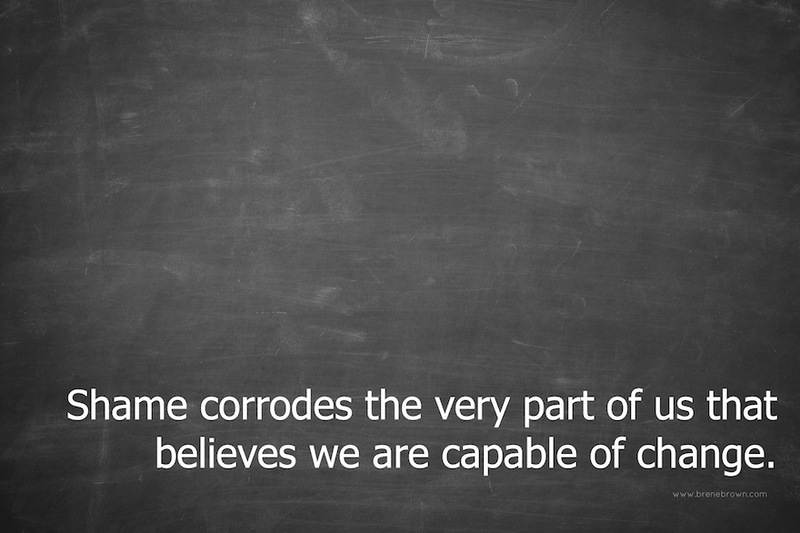 Each shame we experience is embued with the memory of our early shames. These early childhood shames had us worrying we were not okay except without the awareness that these moments of self doubt or feeling not okay are things everyone experiences. 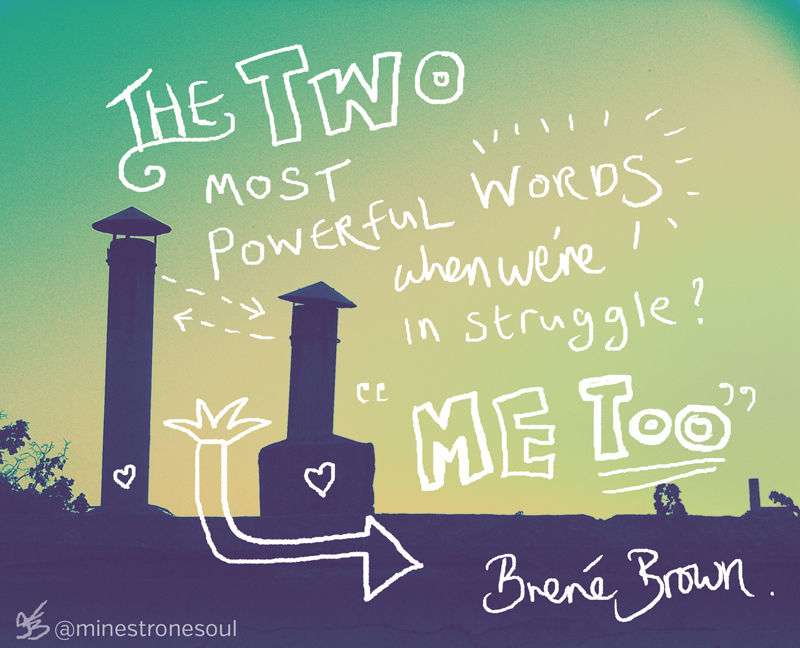 When I watched Brené Brown’s first TED talk, I was blown away by her articulation of what it means to be vulnerable and why it can be so scary sometimes. She spoke of how hard it is to live life with your whole heart. In her second TED talk, I was grateful that she spoke so honestly about her own vulnerability following the huge success of her first TED talk. She said that she had been intentionally flying below the radar, keeping her work small. Her desire to stay small mimicked the findings from her research: she feared what would happen if more people knew about her work. Shenpa is the Tibetan word for attachment. Attachment feels like a mild word for what shenpa feels like. It’s when we cannot let go of something and it takes control of us. We keep returning and playing the same scenario in our mind and in each replaying we feel more and more out of control. We are so attached to the vision of what we want to happen that when something happens outside of this, we easily fall into stories. Shenpa is like shame. Instead of realizing that the world is uncertain and that we have very little control over our lives, we spin out, pretending that if only we hold ourselves accountable, if only we had done things different, if only we took the perfect path, we wouldn’t have to suffer. But this is a lie and it is a lie that disempowers. We can’t go back and undo our past experiences with shame nor can we prevent it from arising from time to time. But we can choose to recognize it when it shows up. We can say, I see you, shame, and I know that you are not telling the whole story. I find it interesting that yesterday the word was regret and today the word is shent. Both of these can cause us to feel strong emotions. In both of these, we have choices. We can regret our experiences and learn from them to make better decisions in the future. Or we can use our regrets to steep in shame, deciding that our regrets alone define who we were, who we are, and who we will be. There is a trick though, to overcome shame. Brené Brown says that if that petri dish growing shame is doused in empathy, shame cannot survive. We need to be mirrors to one another. This is why the practice of tonglen can be so helpful. In tonglen practice, when we are most immersed in our own feelings of grief or anger or loneliness, we can free ourselves of believing we are alone by breathing in our own feelings and the feelings of all the other beings around the planet who are experiencing the same emotions. Then we can breathe out relief to us all. Tonglen is a helpful reminder that, even when we feel alone in our “unique” experience, there are countless individuals experiencing similar feelings. That solidarity can save us from losing ourselves in shame. Amen to the healing power of solidarity and importance of having around us compassionate circle who can help release us from the shame that binds!